The stratospheric ozone layer shields life on Earth from harmful ultraviolet radiation emitted by the sun. 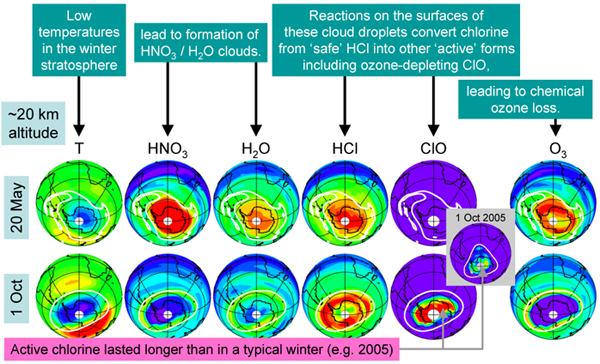 Certain chemicals in the stratosphere (~15 - 50 km altitude) can act to deplete ozone (O3), most notably in the polar winter/spring, giving rise to the Antarctic 'ozone hole'. The ozone hole is the result of a series of complex interactions between chemistry, cloud formation, winds, sunlight and temperature. Chemical depletion of ozone occurs mainly through reactions involving chlorine (Cl). Most of the chlorine in the stratosphere originates from man-made chlorofluorocarbon (CFC) gases released into the atmosphere. CFCs are chemically very stable so, unlike most chemical pollutants, they can survive the several year journey that air takes to travel from the lower atmosphere into the stratosphere. Once in the stratosphere, the CFCs are eventually broken down by the strong sunlight at these altitudes, and the chlorine atoms they contain form the molecule HCl, itself also fairly stable. While HCl is a 'safe' (i.e., non ozone depleting) form of chlorine, HCl molecules are occasionally broken down - by sunlight or reaction with other chemicals - into other forms such as the ozone depleting ClO. Prolonged low temperatures in September 2006 increased by the longevity of 'active chlorine', leading to a record area and depth of the ozone hole. Observations from the Microwave Limb Sounder (MLS) on Aura (Figure 1) show that the amount of HCl in the upper atmosphere (~55 km) is slowly decreasing, reflecting the cuts in emissions of CFCs following international agreements. The long lifetime of CFCs, however, means it will be many decades before the amount of chlorine in the Earth's stratosphere will return to pre-industrial levels. The 2006 Antarctic ozone hole was a 'double record breaker'. Column ozone (the total amount of ozone overhead at a given point on Earth) reached record low values, with low ozone seen over an area larger than that in any earlier year. In addition to measuring HCl and ozone (O3) itself, the Microwave Limb Sounder (MLS) instrument on Aura measures the abundances of other chemicals that play key roles in the ozone hole process. Each winter, air in the stratosphere over Antarctica is mostly trapped in a large (continent sized) pool of rotating air (the 'polar vortex'). This trapping, combined with the absence of sunlight, leads to significant cooling. When temperatures fall below 195 K (-78°C) clouds form from a combination of water (H-2O) and nitric acid (HNO3). Figure 2 shows maps of observations from MLS at around 20 km altitude on two days in 2005. May 20 is early in the winter, before these 'polar stratospheric clouds' (PSCs) have formed. By October 1, 2005, a significant reduction is seen in both HNO3 and H2O, implying that these gases have been converted into PSC form. Reactions on the surfaces of the PSC particles convert the bulk of the chlorine from HCl into other species, including the ozone-depleting ClO. Figure 2 shows a notable decrease in HCl observed between the two dates, with a corresponding increase in ClO. 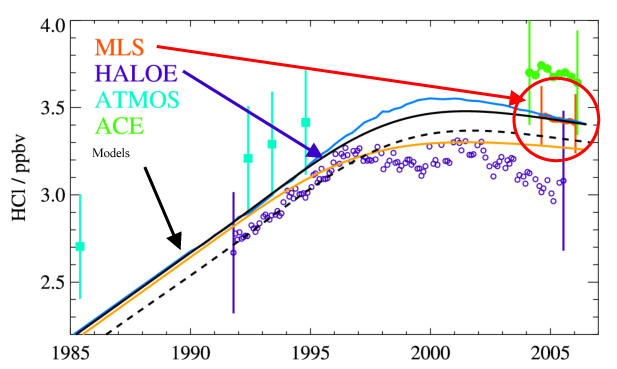 Finally, a dramatic decrease in ozone is seen, in large part due to the chemical interactions between ozone and ClO. During the 2006 Antarctic winter, stratospheric temperatures remained cold for longer than in previous years. This prolonged the duration of the PSCs and in turn the period of chlorine 'activation', increasing the amount of chemical ozone loss. For comparison, by the same October 1 date in 2005, the amount of ClO was already on the decline, with significantly less than seen in 2006. Observations of Hydrogen Chloride (HCI) at ~53 km in the atmosphere. Purple points are data from the UARS HALOE instrument, while red are from Aura MLS. Data from the ATMOS and ACE instruments are shown in cyan and green respectively. In all cases the error bars indicate the estimated accuracy of the measurements. The solid and dashed lines indicate the expected abundances of HCl based on chlorine emissions and models of atmospheric transport.